If you are looking for a reliable restorative treatment, Drs. Donald Ross, DDS, and Neal Shah, DDS, can explain the numerous benefits of dental implants. At our Atlanta, GA practice, we proudly offer these state-of-the-art restorations, which will replace your tooth roots. 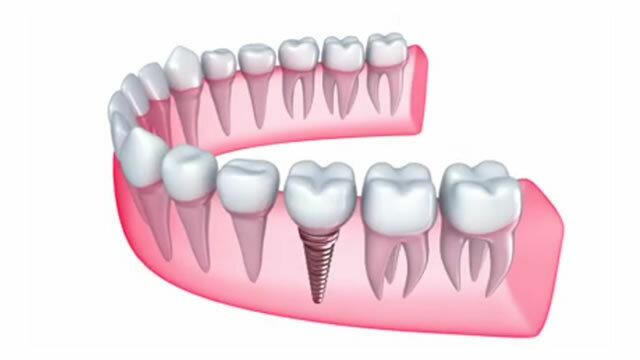 After your jawbone heals around them, dental implants can support a permanent crown, bridge, or denture. No other dental restoration offers the stability and durability of dental implants. They can also improve the cosmetics of your smile, and they offer important protection for your jawbone health. Perhaps the most important benefit of dental implants is that they can prevent jawbone recession. If you choose dental implants, we will refer you to a skilled oral surgeon with an office just next door to our own. We have worked with the same surgeon for over two decades, and we trust the continued quality of his work. He will place your implant posts, carefully maximizing the strongest areas of your jawbone for support. Over 3 to 6 months, your jawbone will fuse with the biocompatible titanium posts. Through this process, the implants will become firmly anchored in your jaw. When your bone has fully healed, Dr. Shah or Dr. Ross will attach your custom-designed restoration. Once attached, your crown, bridge, or denture will never move around in your mouth. Therefore, you can eat a varied diet without worrying that you will damage your restoration or pull it out of place. Because your implant-supported restoration will be very stable, it will not affect your normal speech patterns. With proper care, an implant-supported restoration could last the rest of your life. Over the years, implants could be a very economical choice since you will not have to worry about replacements or repairs. Dental implants can also improve the look of your smile. A traditional removable restoration will need a plastic base and/or metal clips to keep it in place. In contrast, just like natural teeth, an implant-supported restoration will sit right along your gum line. Consequently, your restoration will be virtually identical to your biological teeth. Perhaps the most important benefit of dental implants is that they can prevent jawbone recession. Your dental roots emit regenerative signals to your jawbone. Accordingly, your body naturally replaces bone tissue lost through consistent biting and chewing. However, when you are missing teeth, your jaw will no longer receive the needed signals, and your bone will start to shrink. Over time, you could suffer significant tissue loss. This shrinking of the jawbone can destabilize your remaining teeth as well as cause a sunken facial appearance. By replacing your tooth roots, implants will also send out those important signals. In this way, the posts will protect the shape and proportions of your jaw. Implants can also prevent additional tooth loss since jaw recession will cause your bone tissue to pull away from your dental roots. To learn more about implants and to schedule your consultation, contact our office today.